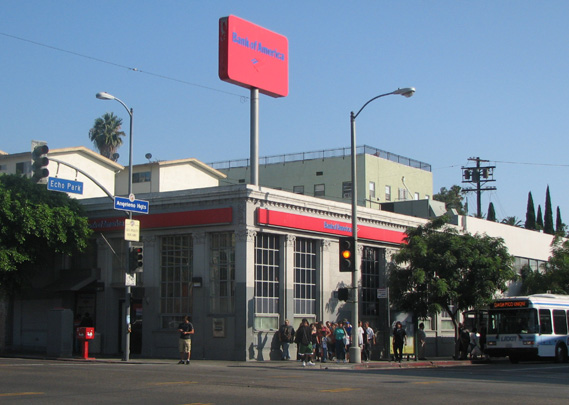 The Echo Park Branch Bank of America building is an important part of the growth of the largest banking institution in the nation and the introduction of branch banking by A. P. Giannini, the Bank’s innovative and highly successful founder. The building was the first to be built in the Echo Park for the exclusive use as a bank. It has remained under the B of A ownership since its construction. In reality, the Beaux Arts structure on the corner was partially a new construction and partially a redesign of an earlier Mission Revival building that was built in 1908. All of the design work was done by Morgan, Walls and Clements, which was then and still is the oldest architectural firm in Los Angeles. The building exemplifies the use of the classical Beaux Arts design elements that are found on many of the most iconic larger building of the early 20th Century, many of which have been recognized as HCMs by the City of Los Angeles. While the style is more prevalent in urban areas such as downtown and Hollywood, it is fairly unique in the more low-scale suburban areas. The combination of the history and the architectural statement makes this small bank building an important link to the story of the growth of Los Angeles.